Welcome to Plains Hollow, Missouri. This Halloween everyone is getting a second chance. 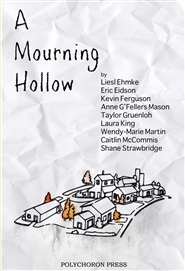 The residents of Plains Hollow, Missouri love to celerate Halloween, but this year some folks are having a hard time with life. A clown loses a childhood friend, the local cat lady doesn't like the new vet, the high school janitor gets her house coverved in toilet paper again, and the pet psychic got demoted to being a zombie at the town's Haunted Hollow Festival. And that's just to name a few! A great play to be produced everywhere! Love is like this fragile thing… and so is Leo’s sanity and stuff. Leo finally finds the man of his dreams—who immediately dies in his bed. Face-to-face with his lover’s grieving family, Leo tells a little white lie. And then another. And then a whole hell of a lot more. And then his best friend starts judging him, and his dead lover’s brother wants a piece, and his dead boyfriend shows up demanding fidelity… And on top of all that, he might be going a little bit nuts. But it’s all worth it, right? This is the man of his dreams. 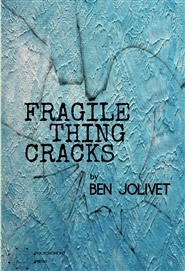 Fragile Thing Cracks is a dark comedy about love, loneliness, and the delicate line between sanity and something else. 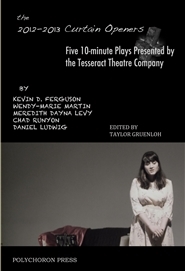 The Tesseract Theatre Company introduced a series of ten-minute plays during the 2012- 2013 theatrical season. For every full length theatrical production there was a ‘Curtain Opener’, a newly commissioned ten-minute play by emerging contemporary dramatists from around the country. 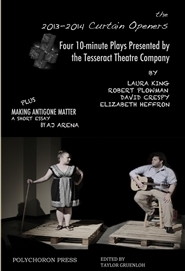 These five ten-minute plays share the theme of gender retrospection. From Ferguson and Levy’s examination of romantically challenged relationships to Martin and Ludwig’s gender expectations to Runyon’s Shepardesque spousal argument. It’s short, but dramatic, theatre at its best.